Over the last week, Gold again hit new record prices – hitting our long-term weekly target at 1133.24. There is speculation that since India recently bought 200 metric tons from the IMF and increased its holdings to 6% that China will follow. China is the largest producer and consumer of gold in the world. Many economists expected that the sale of gold to India by the IMF would cause the price of gold would fall. However, the bottom did not fall out because this purchase was known a year in advance, and the markets have already largely priced this news in. This is after all not a change in the balance of supply and demand, it is simply a change of ownership. So, what's ahead for the precious metal? The 1133.24 target which was hit on Friday represents the 138% Fib extension of a prior 38% retracement, effectively concluding this long-term pattern. 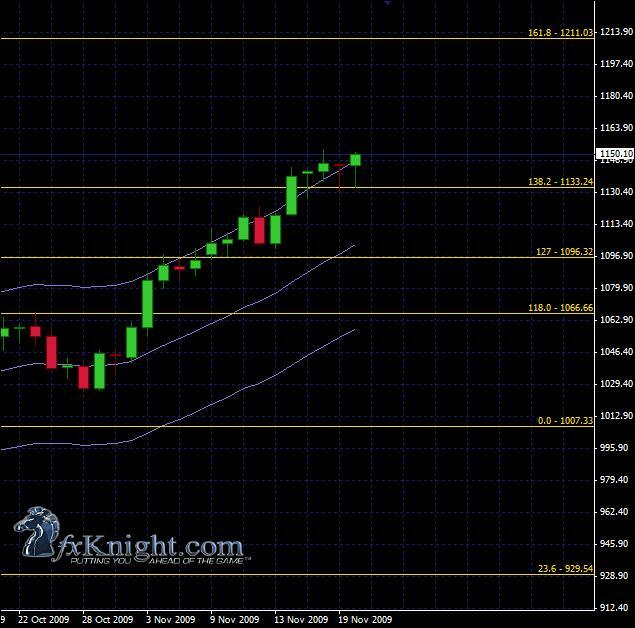 Nevertheless, price has continued to hold support above 133.24 on the daily chart, suggesting gold may be a good candidate for a “bonus round” up to the 161% Fib level at 1211.03.